For 13 tantalising seconds in the newly released Pathe archive newsreel above, we are treated to the full broadsides beauty of King George V’s G.L. Watson-designed cutter, Britannia: the special one; probably the most famous racing yacht there will ever be; in her element, easing to windward through the Firth of Clyde waters of her birth; competing incredibly well against Mrs Workman’s much more modern Charles Nicholson design, Nyria. Nyria had been the first of the largest yachts to be retrofitted with the modern, triangular bermudan (or marconi) mainsail, in 1921. But it would be a few years yet until universal acceptance in the Big Class. As can be seen, gaff rig still ruled on the Clyde in 1923; what a feast to the eyes that gives us. There’s a great rig comparison between Britannia and Nyria in this very short clip, perhaps from the same day. The other Big Class competitor on the Clyde that year, but unseen here, was Terpsichore (later Lulworth), always gaff rigged. Despite 14 years age difference with Nyria and 27 with Terpsichore – and her old-fashioned yet highly evolved gaff rig – the longer Britannia received no ‘home’ favours from the local handicappers in 1923. They well knew that in the past winter she had completed a major bottom structure rebuild to bring her into Lloyds survey class as if new, and her rig had been modernised two years earlier under locally based supervision by Watson’s star pupil, Alfred Mylne, including the fitting of a Ewing McGruer Hollow Spar Company ‘plywood’ boom. So Britannia was scratch boat in class, giving over four minutes to Nyria and over seven to Terpsichore in forty miles. But it worked out just fine, with the royal cutter saving her time in enough races to win overall. The smaller, dark-hulled cutter with exquisite lines in the early shots of the fleet running out of Rothesay Bay is, of course, another G.L. Watson design, Verve (IV). She was built in 1899 by Robertson of Sandbank as a handicap racer for Watson’s faithful client, Robert Wylie, of the Glasgow country house and yacht outfitters Wylie & Lochhead. From the Glasgow Herald reports it is easy to understand that this was the first time Clyde yachting folk could truly feel that things were getting back to something like the pre-first world war sunset of ‘the golden age’. That war and its awful consequences would have touched most of the participants, including John Bennet who lost his son to it. The joy of sailing can be a healer. Pathe recently released 85000 of their archived newsreel clips to YouTube, an amazing treasury of moments in time, weird, horrific and wonderful. In this case only wonderful, and all the better for being from the silent era so that we’re spared the outrageous commentary of the 1930s through 1960s. Also very well worth watching at the Peggy Bawn Press web site is one of the oldest known moving image clips of yacht racing, filmed at Hunter’s Quay on the Clyde in 1899 by Belfast whiskey distiller Robert Mitchell, and featuring two of G.L. Watson’s Big Class designs. The web site is also the place to read more about Martin Black’s G.L. Watson biography, G.L. 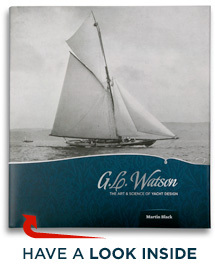 WATSON – THE ART AND SCIENCE OF YACHT DESIGN and to even purchase it securely online. This entry was posted in archives, Big Class, boatbuilders, boatyards, book, Britannia, Clyde yachting, Clydebuilt, film, Firth of Clyde, G.L. Watson, G.L. Watson & Co., gift, Glasgow, Irish yachting, leather-bound, limited edition, Martin Black, naval architect, object of desire, other yacht designers, yacht design, yacht designer, yacht racing, yachting history and tagged Alfred Mylne, Charles Nicholson, Clyde Fortnight, Clyde Week, Clyde-built, Cork, Ewing McGruer, Isle of Bute, John H. Bennett, Lulworth, McGruer Hollow Spar Company, Mrs Workman, Nyria, Pathe, Robert Wylie, Rothesay, Royal Cork Yacht Club, Terpsichore, Verve, Wylie & Lochhead, yacht handicap. Bookmark the permalink. Reblogged this on Go Nautical.